Joe and I were talking at dinner the other night. We were remembering when financial times were easier for us. When we wouldn't think twice about buying a "gourmet" jar of pasta sauce for $8. Heck, we'd buy 2 just to make sure we had enough for leftovers! Oh! The joys of living in a two-pay-check household! Now, with just one of us earning an income, I make homemade sauce and get 4 or more meals for well under the price of that $8 gourmet jar! There are other ways that we have cut back or tightened our belts. Most of the time, I enjoy the challenge of finding new ways to save money and be frugal, but at times there are needs for a splurge or a treat. One of our last BIG splurge purchases before my paychecks ran out, was a new bed. For years, we just had our mattress on a standard bed frame. You know, the kind that come with the mattress? Well, when we moved from our apartment to our house, we decided it was time to get a decent piece of furniture. And I'm so glad that we did! It's so nice to relax in our big, beautiful bed after a long, busy day! Anyway, this discussion came up because we were trying to figure out what we NEED for the house. There are plenty of things that we want for the house and most often these items go on the "wish list" and we try to get what we need the most from the list. Of course there are the FUN items on the list. Things like a new computer or bigger TV or Central Air. But then we have our more practical items like a refrigerator or a new stove or replacement windows for the house or even a second vehicle! So, for a little fun, I thought I'd ask my readers: What's on your "wish list"? To add to the fun, Caitlin from CSN Stores offered me a chance to giveaway a $40 gift certificate to one of my readers! The one-time-use gift certificate can be used on any of their 200 + websites! Cool, huh? I thought so! Now, let me just say: I love CSN Stores! 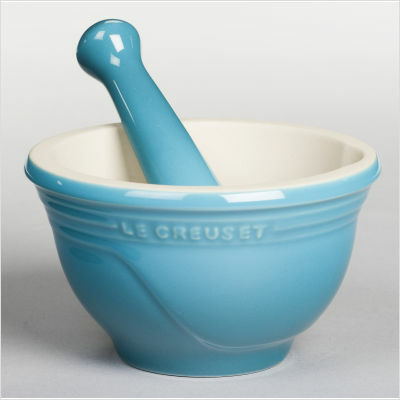 And soon after that, received this Le Creuset Mortar and Pestle as a gift from my friend, Lisa. It was ordered and shipped directly to me from CSN Stores. The other day, I posted about a sale going on at BedroomFurniture.com, one of the many CSN Stores websites! Visit CSN Stores and leave a comment to let me know "what's on your wish list" from their sites. Blog about this giveaway and leave me a comment with the link to your blog post. There you go! Four chances to win a great prize from CSN Stores! Giveaway is open to U.S. and Canadian residents only. In the case of Canadian residents, international fees may apply when ordering certain products. Giveaway ends on Wednesday, July 14th at 10:00pm, EST. Winner will be contacted by email and will have 48 hours to respond to claim your prize! I follow your blog!! I will be back with my blog post later tonight!! Anyhow...I would pick those figurines to re-complete my collection! Oxford Sonoma Outdoor Bar Set - is what I wish for. What I would buy would be a skillet. I am now a subscriber and google friend. My wish is for more Kitchen Gadgets. 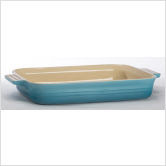 I would love anything Le Creuset...I am becoming obsessed with it!!! All of the le creuset stuff is so very tempting, but I've wanted a good cast iron skillet for a long time, so that would be at the top of my wish list! I would LOVE!!! to have the Nesco Professional Grip 'n Go Handheld Blender / Mixer. This would be GREAT!!! for making shakes for my grand-daughters this summer. I would love to get this for my very active 1 yr old kittens to play with. I enjoy your blog and I was already a Google Friend Connect follower as sucor_2. Thanks for a chance to win! I'm already an email subscriber - love having this option! I really really want the Bliss Hammocks Polynesian Hammock Chair. Perfect for summer! Hi, great blog! I am a follower, thanks! Great giveaway! Hi, Great giveaway! I have had my eye on their baking stuff! Like a bundt pan or some of the cookware, I so need new stuff, thanks! The Dale Tiffany Accent San Juan Table Lamp, Antique Bronze is on my wish list! I really need a new skillet! Hubby informed my the other day how awful mine is!! GFC follower, your blog is so cute! hm... on my wish list... I'd love the All Clad stainless steel baking sheets! a new rug for my living room is on my wish list! It may seem silly but on of the items at the top of my wishlist is a nice corner shelf. My living room is so bare so this would help out. CSN has a variety of different ones and they are all so nice! a waffle maker is on my wishlist! I follow Under the Big Oak Tree with Google Friend Connect.